The above photo was taken about 1 p.m. on the Ides of March. A railfan's Mom once worked at the McDonald's ahead. In the early 1970's an old hotel or restaurant was torn down to make way for McDonald's, which had interior decorations of trains. Then that McD was demolished and rebuilt with a drive-thru. At some point, this part of Railroad Avenue may host the crane to remove old slabs and drop in place the new platform slabs. At one of the early meetings about this project, an owner or representative of the Wantagh Inn complained of possible disruptions to her business. My Mom worked at that McDonald's in the late 1970's, and when she would go up to the platform for a cigarette break (back then you could smoke on the platform) and she almost tripped and fell quite a few times. The station had only been elevated for a decade and it started falling apart. I got news from CBS 2 that to fix the problem with Phase I they will make changes to the platform heating system (which is working like a charm) so that there are no issues come next winter, and all those patches, blemishes, and unsightly discolorations will be sealed over for better integrity. I still think that the station will experience issues 10 years down the road. The elevator is the biggest complaint because last week I believe there were 11 passengers stuck in the elevator for 45 minutes and the fire department had to get them out via the top of the shaft. It was the 5th time since it went into service that it broke down. This station is Babylon, this is the train to Penn Station. Stopping at: Lindenhurst, Copiague, Amityville, Massapequa Park, Massapequa, Seaford, Wantagh, Bellmore, Merrick, Freeport, Baldwin, Rockville Centre, Lynbrook, Valley Stream, Jamaica, Kew Gardens, Forest Hills, Woodside, Penn Station. As an update to my last post a month ago on the topic, people were complaining about only the concrete platform. They had no issues or insulting statements about the appearance of the new station regarding the canopies, waiting room, electronic signs, and lighting. I've been monitoring the escalator/elevator statuses across the whole system via the MTA's website, and it appears that the issues regarding Wantagh's new elevator have been solved. In fact as of this post there are only four apparatuses that are out of service/"NOT WORKING." Seems that KONE, the elevator's manufacturer finally got a more thorough check to see what the real issue was. 1.) Escalator at Penn Station in Concourse A. 3.) Elevator at Ronkonkoma for Platform B, the island platform. Hopefully our new president of the LIRR, is more thorough. An activist for people with disabilities is calling for, and I've said it since I joined, elevators to be installed at Lindenhurst, Copiague, Amityville, Massapequa Park, and Mets-Willets Point (which is only handicapped-accessible if you take the 7). The elevator issues, throughout the years have their been any instances of newly-installed elevators (especially at rehabilitated stations) breaking down every other day? To me, the reason and sole reason why Wantagh's issues arose was because of the pipe-grid melting system breaking near the elevator, or the fact they decided to put one in and the fact we had the bitterest winter in terms of high temperatures in decades. I don't see Seaford or Massapequa with a sub-platform heating system. I would have preferred they install it AFTER the platform was finished. 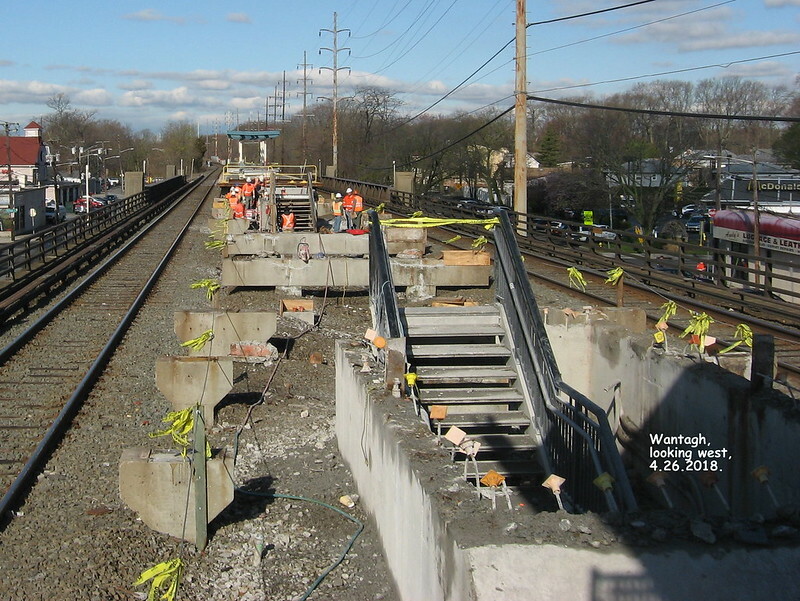 They will be adding an industrial sealant after the West half is finished to give it a uniform look along the 12-car platform, and to prevent any further issues, and the LIRR will be overlooking Fortunado and Sons for any penny-pinching that was done before. 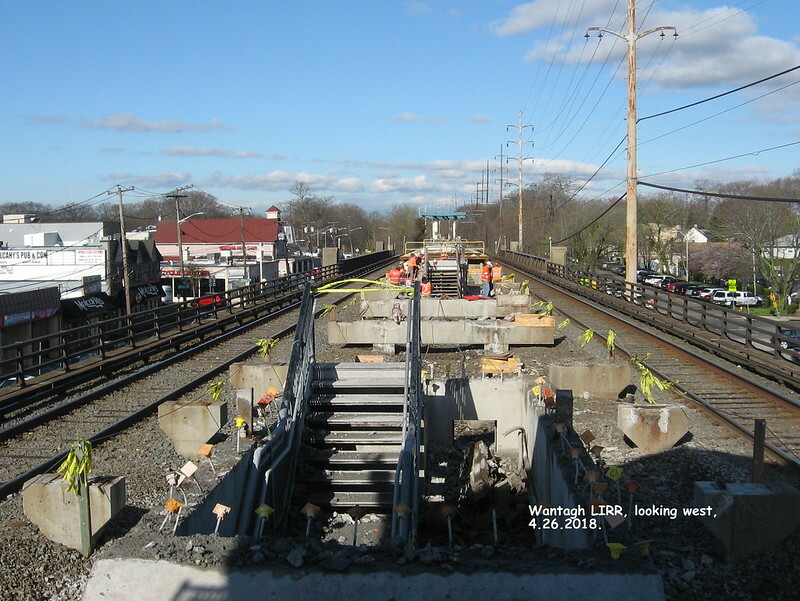 The LIRR is not going to say the job is finished until it is suitable and up to today's code. They will nickel and dime F&S until they the LIRR gets what is intended and what they were envisioning and what they expected. One thing is for sure, a non-union contractor will NOT be given a grant to oversee future construction. I don't expect those patches and sealcoating to last 40 years. If this was the contractor's error, the MTA should have required them to replaces the slabs outright. 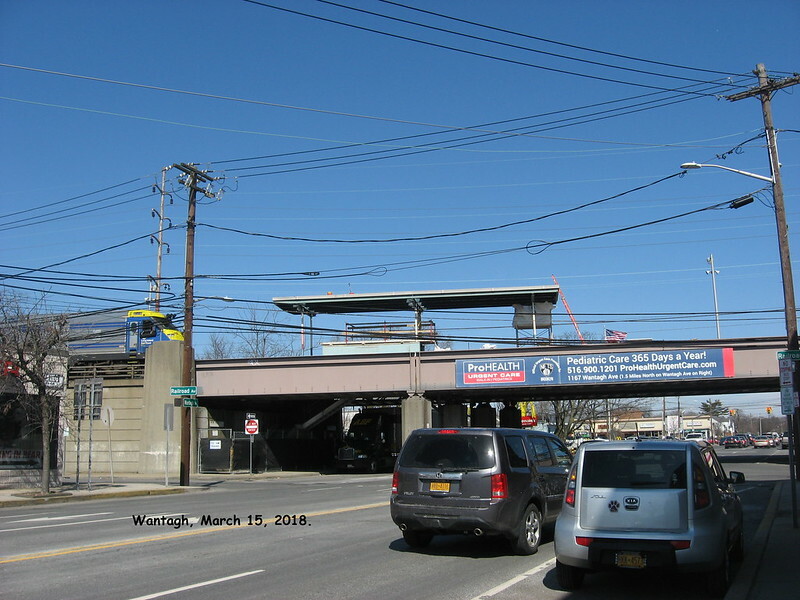 Earlier this week, that is, around April 17, 2018, the crane was west of Wantagh Avenue, lifting slabs and other materials off the west end. I could hear pneumatic drills and cutting saws working as I sat at McDonald's window. I guess they were having trouble dislodging some of the slabs and getting each into the sling. All rail movement was on Track 1. The street near Brand's bicycle shop was blocked. No big deal on blocking off Railroad Avenue to the West of Wantagh Avenue because that's just a shortcut so that you don't have to deal with the traffic light. Inconvenience for parking to that restaurant and Brand's Bicycle. I still say that for the benefit, they shouldn't have put in the heating system to begin with. As far as weather goes, you can't control the fact we were below freezing non-stop for several weeks. Again, a non-union contracting company was awarded the contract for the project. One canopy must still be removed, as of April 26, 2018. In the foreground is the main staircase, with a hole from which the escalator was removed. It is said that the new escalator will be wider. The condition of those supports shows exactly why Phase I finished nine months later than it should have. I grew up with the railroad and for a guy who is only 27 I have never seen such dilapidation of a structure, they have no choice but to rip out the supports like teeth and put in new ones. If only they could come up with a machine similar to the TBM and NTC that would lay it down instead of using a crane to hoist up the slabs. All the blemishes, I've looked at photos and most are towards the center of platform. The new escalator is planned to be wider, as far as the elevator is concerned, there have been no further issues. KONE inspected it up and down and all around, discovered that the patch work caused water to possibly leak into, or it wasn't fully sealed and safe from the freezing temperatures causing it to seize up. Then again is it normal for a new elevator to break down like that? Monday evening, May 7th, twelve in the elevator. I'm guessing that these folk ride the sixth car and park west of the station. Or maybe they go directly from work to Mulcahy's. Using the elevator means no walk to Beech Street and back. Hicksville didn't have one put in, Seaford didn't, and Massapequa didn't have the platform-heating system in their schematics for their rehabilitation. Wantagh wouldn't have the blemishes that plague the face of the platform, and Fortunado and Sons. are really getting on my nerves, lighting the fuse to my Autism-inflicted brain that might have damage from birth and years of abuse from my Father's side of the family and the school district here in Pennsylvania. I like change done when it comes to certain aspects of the LIRR, but this is a change that I'm sensitive about. My solution would be to just remove the water or the system itself, and replace all the parts in the elevator. If the motor breaks down then someone get me a stationary bike, attach it to the motor to provide electricity so it doesn't lose power or seize up, and I'll pedal away when they have has to use it. Just bring some bottled water, salt bagels, or anything with carbs because I will be pedaling fast breaking a sweat. Thank you! -All the concrete slabs have been installed. -Brick has been laid for the outer part of the staircases and escalator. -There is a skinny portion at the West end for the new Wantagh Avenue staircase at the trestle as opposed to a full-wide platform where those two lights were. -The meeting point for the two halves sees the extension of the canopy into Phase II that covers the waiting room and elevator for quite a distance. I have not seen a West end canopy erected yet. The canopy at the East end of Phase II has been erected, but still needs the decorative work and removal of those temporary steel cross beams. -I left a message for the LIRR thanking them for getting on Fortunado and Sons INC. for getting for setting the record straight when it comes to the condition and cheap work of Phase I. Since they did it, the elevator works flawlessly, and does not see experience a breakdown every week and then it's out of service. Recently it broke down, they had it fixed in 72 hours and was back in service. This was the first time the elevator had an issue since May, and it's not an OTIS it is a KONE. 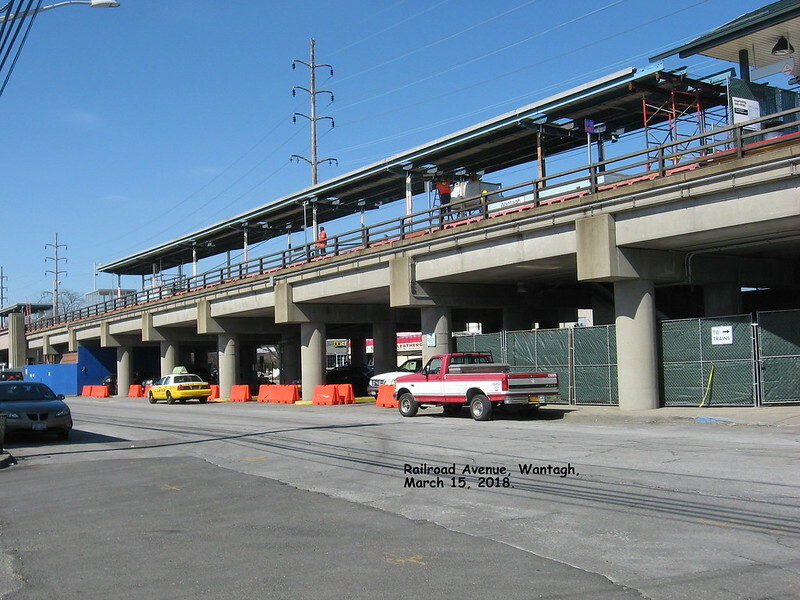 Someone told me that Phase II of the rehabilitation of Wantagh is completed and that it is now back to a full 12-car platform. Is it true that the Wantagh project is completed, because it said a September 2018 completion, but if not I estimate it would be November 2018. From my train this morning, Wantagh Station still has a divider at the middle of the platform. The western end is nearing completion. The canopy lights were on this morning but it is not open yet. Red running boards were on the platform waiting to be installed at the platform edge. It doesn't look like much longer. Yes, not much longer, but work continues. I said to a couple of workers on the street level, "Maybe two weeks?" Reply, "Maybe, but they keep putting holes in the concrete." At the bottom of the escalator, old slabs of concrete on the Railroad Avenue side have been lifted out. The north side has had new concrete poured and in use. On the platform level, men are working on scaffolds, maybe wiring the canopies. Passengers can use the elevator, but there is street-level work, south side. Passengers can use all three entrances to the ticket office, which today (of course) is not staffed. My observations as of 9 a.m. Thursday Sept. 27. It's a new month and a new 12-car platform at Wantagh. I rode the new escalator up and found almost everything perfect. There are no cracks to trip on. One small problem: The stairways to Wantagh Avenue are signed "Buses," but NICE stopped service a year ago on the N73 and N74, handy routes to Levittown and Hicksville. The only buses that might show up are the charter trips from Mulcahy's Bar to football games in the Meadowlands. The escalator was supposed to be wider, but it might be 2 mm wider at most. Loudspeakers repeat the annoying safety messages on how to ride an escalator. Both top and bottom have poles which appear to have photoelectric cells and mirrors, perhaps to halt the escalator if someone attempts to ride a bicycle on it.